One of the rarest British bumblebees, now restricted to machair and other flower-rich areas in the Orkneys, Scottish islands, and Caithness and Sutherland. The species appears to have a particular association with red clover. A large species, the abdomen and thorax are entirely covered with sandy-yellow hairs, with the exception of a black band across the thorax between the wing bases. Great yellow bumblebee. Photo credit: Roxanne Curtis (left). 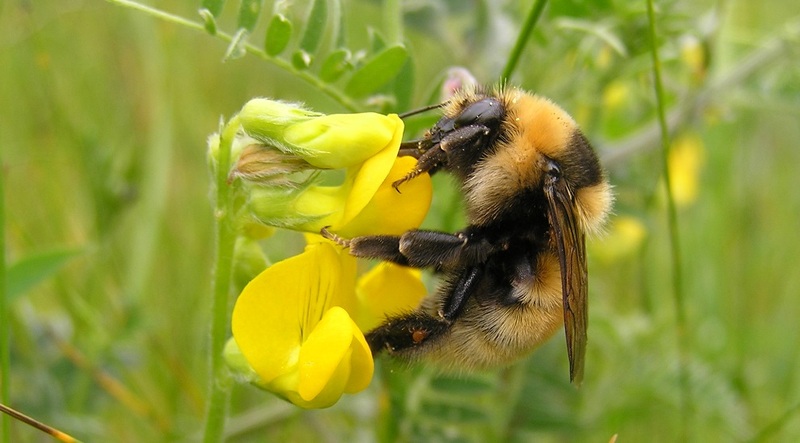 View our Great yellow bumblebee factsheet here. Males of the Short-haired bumblebee (Bombus subterraneus) are similar, but the species is only found at Dungeness, several hundred miles from the nearest Great yellow bumblebee. The Field cuckoo bumblebee (Bombus campestris) can also appear similar, but the short face and lack of pollen baskets of this species should be distinctive. The ginger carder species (Common carder, Bombus pascuorum; Moss carder, Bombus muscorum; and Brown-banded carder, Bombus humilis) can occasionally fade to yellow and appear to show a black thoracic band, but close examination will show this to be the black cuticle showing through an absence of hairs, rather than actual black hairs as in the Great yellow bumblebee.